Thanks for your great game threads as always pio2u but the game is at 4:30pm PST. You've got the date correct in the post but the title shows 2/11/19. Thanks, I had eastern time. Woke up way too early & no coffee. Hm probably a win but who cares. We already lost too much games anyway. This one has zero importance. Every Laker game is important to me. Plus we want to gain momentum going into the All-Star break. GO LAKERS! Unfortunately, going 6-12 in the west without Lebron made many of these upcoming games must win. Here's hoping the Lakers bounce back after a day off in Philly and another day to rest. Here's also hoping Luke fixes the fiasco player rotation scheme from last game. 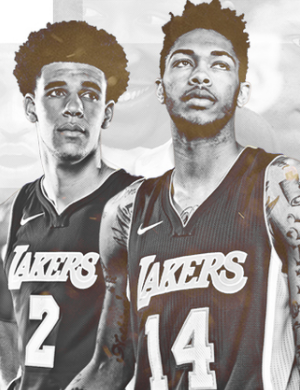 I think the Lakers are going to get a road win. This is now must win when you need to win. Lakers are going to make the playoffs, but they need to get into the 5-7th seed to make an actual run in the playoffs. Time to win the games your supposed to win. The Lakers have proven that you can't take any team for granted. At this point, all games are crucial. But especially the winnable game right before the all star break. We need to win and play well to gain confidence and peace in the locker room. This is now must win when you need to win. Lakers are going to make the playoffs, but they need to get into the 5-7th seed to make an actual run in the playoffs. Time to win the games your supposed to win. We lost to the Cavs and Knicks... at home. This one won't be easy. Very good point; definitely not a given. The team better not come out flat or it could be a long night. Josh Hart had a PRP injection to help treat the tendinitis in his right knee. As ESPN's Adrian Wojnarowski reported, Hart will be out through the All-Star break and will be re-evaluated after that. State Farm Arena will be sold out, loud and loaded with gold-clad fans who want to see the visiting team and its star player, LeBron James. Pierce is eager to see how his young Atlanta team will react to all the hubbub, as it tries to stop a three-game losing streak and end its inability to win at home. The Hawks have dropped five straight on their home court. "When you're in a little rut like we are ... spirit, energy, effort ... the best thing is to have a team like the Lakers come in," Pierce said. "Huge fan base. We know there will be a lot of Lakers fans in here, a lot of people showing up. As an athlete, you want to perform when the lights are on and there are a lot of people." Atlanta is in the midst of a seven-game homestand. The Hawks have dropped their first three games, to Toronto, Charlotte and Orlando. They did not play well in Sunday's 124-108 loss to the Magic, a game in which Pierce took out all his starters as a unit in the middle of the third quarter in an attempt to send a message. The Hawks officially waived Lin on Monday afternoon. And according to Adrian Wojnarowski of ESPN, Lin's next stop will be Toronto. About time they did this.. It's been blatantly obvious for quite awhile, happy they finally did it though! Hopefully he comes back and provides that all around spark we have been missing for a long time.. Him and Lonzo coming back healthy could give us a huge boost going into the playoffs..... hopefully. Speak it in to existence! The Philly lose is excusable. They are an uber talented team - T Harris puts them over the top IMO. Loosing to ATL would be inexcusable. ATL scoring over 108 pts would also be inexcusable. Season starts now - time to get serious. Still hoping for a 22-4 finish the rest of the way. 50-32.